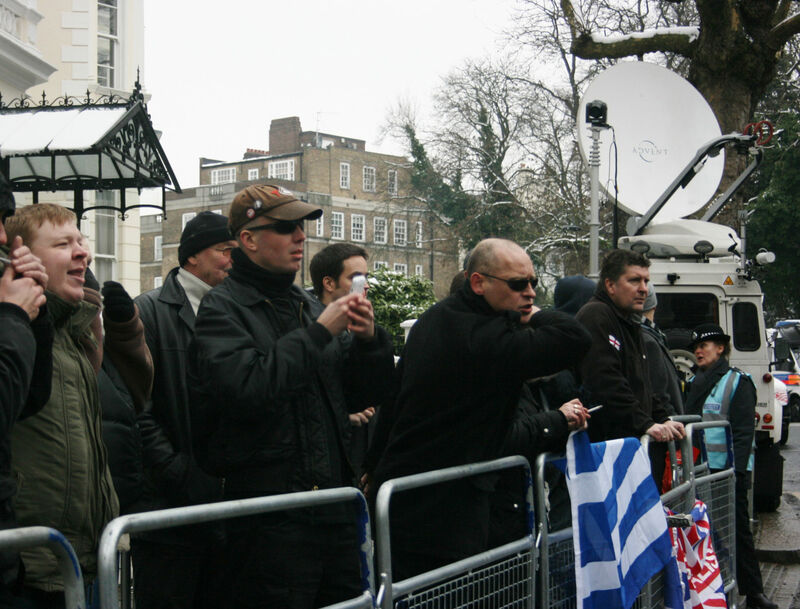 Is there a future for England’s Golden Dawn? As Nikos Mihaloliakos, the head of Greece’s far-right Golden Dawn Party, is to appear in court on charges of organising a criminal group after the murder of an anti-fascist rapper, we take a look at the effects the party has had on the English far-right. Golden Dawn flags draped behind the band, skinhead music blasting from the speakers and an inspired crowd at an unknown pub set the scene. The pub however, is not located in Greece- but in the outskirts of London, where Greek black metal band Der Sturmer has been invited to play as a token of support by English comrades. 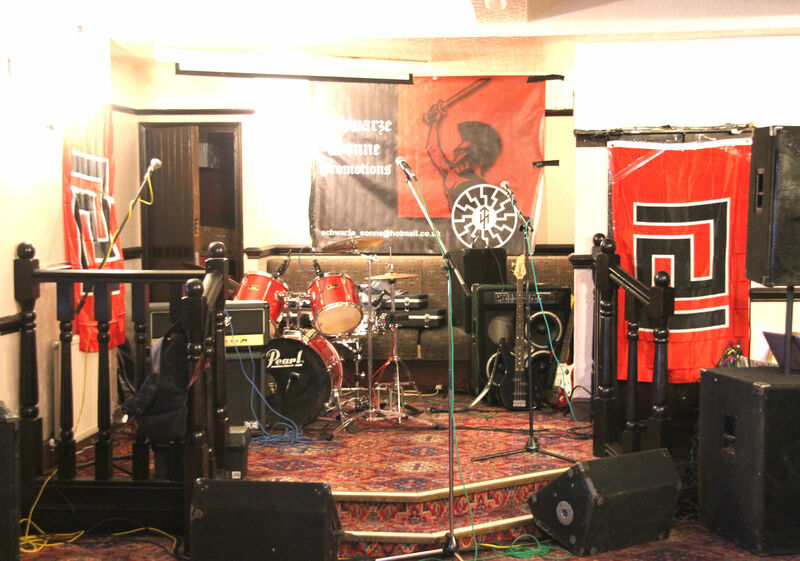 Set of a Golden Dawn gig in the outskirts of London. Last June in Greece, the extreme right wing party won 18 seats in parliament, gaining public support by using the harsh financial crisis that the country has faced. As the latest figures show, Greece has hit 27.9% of unemployment, with youth unemployment rising to 57.8%. The astonishing figures have helped the party, which is pushing tough anti-immigration laws to a nation desperate for a solution. While in the UK unemployment stands at a current rate of 7.7%, official figures have shown that average earnings have declined, affecting living standards. While the situation is clearly not as extreme as it is in Greece, UK supporters of the Golden Dawn believe that the situation will worsen, and when it does, it will make way for the British right to rise. Gerry Gable, founder of left-wing Searchlight magazine, said the Golden Dawn has unsuccessfully tried to build bases in New York and Australia. However, he refused to comment further on the matter as Searchlight supports the No Platform Policy, which believes groups like the Golden Dawn should not be given a voice in the media. And what of the older, well established far-right movements and organisations in the UK such as Combat 18 and Blood & Honour? According to Albert, some of the people involved in Combat 18 back in the days travel to Greece from time to time and meet with members of the Golden Dawn, but C18 does not exist as an active political organisation anymore. Groups like the aforementioned now dedicate their time to putting on RAC (Rock Against Communism) and other type of ‘pro-white’ music. Some of the band members have political links to the Golden Dawn and the concert which took place in a secret location outside of London was seen as a meeting for neo-nazis. John is the only NSBM organiser in all of the UK and he explains how the lack of a patriotic or pro-white metal scene has inspired him to create one. “This is an attempt to encourage younger people in the metal scene to create something new,” he said. “A lot of other countries in the world have an NSBM scene.” Some of these countries include Russia, Poland, France, Greece, Italy, the USA and go as far as Ecuador and Brazil- but that’s another story. Previous concerts organised by him have sometimes been cancelled by the police and anti-fascists, but because the Golden Dawn is a legitimate registered European political party which was democratically elected, he was not so worried about it being cancelled; had the plug been pulled, it would have been a “breach of free speech”. So has the Golden Dawn made an impact in British politics? 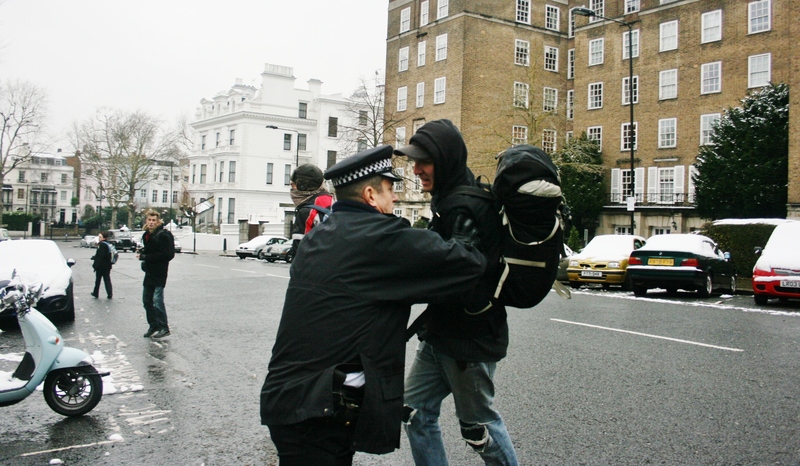 While people seem to have been inspired by a democratically elected radical party, many supporters in the UK are looking for an organised movement that they feel they can support, and clearly there is not much choice for them at the moment. Apart from the mentioned organisations, such as Combat 18 and Blood & Honour, there are a few Facebook groups such as the newly established English Resistance Movement, started by Albert himself, who admits these are “merely facebook pages for internet warriors” rather than actual organisations. Two videos that summed up conflict in 2014 for me.